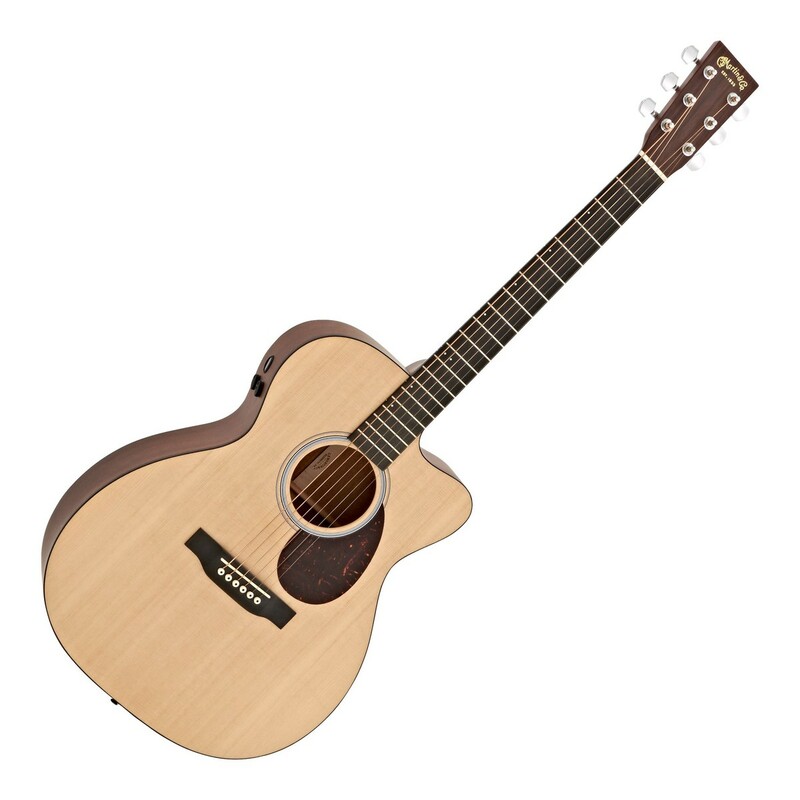 The Martin OMCPA4 Performing Artist Electro Acoustic comes equipped with a sonically-pleasing mixture of tonewoods, on-board Fishman electronics, and a comfortable venetian cutaway profile, perfect for the professional performing musician. With a sitka spruce and sapele construction the OMCPA4 Performing Artist produces a versatile character with a broad dynamic range that is both consistent and well-balanced across the sonic spectrum. Additionally, the overall tone produced is full, deep, and resonant while the 000-14 fret body projects superior tonal balance and full, rich sound. 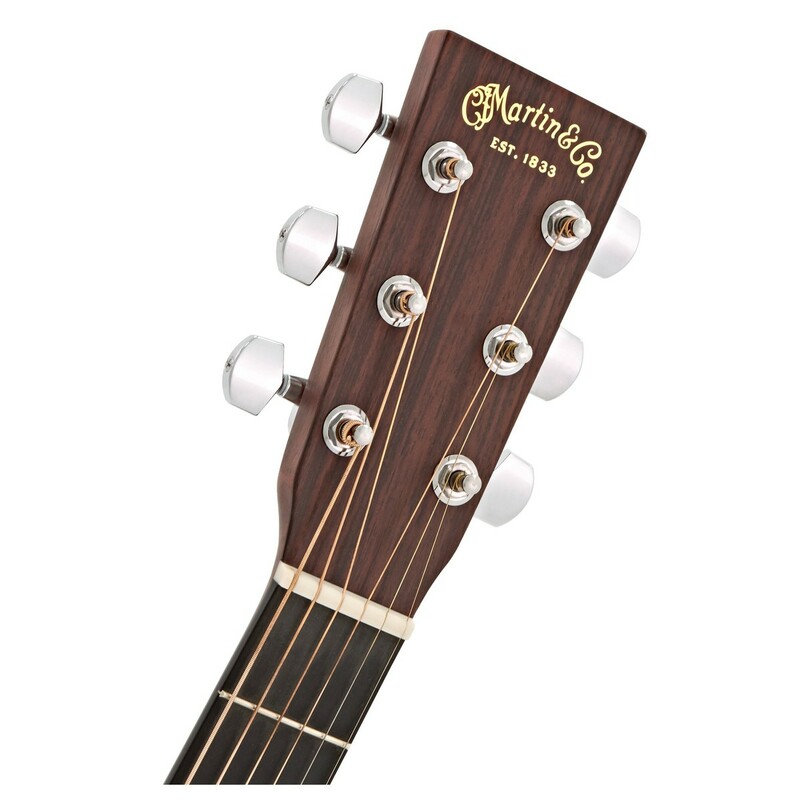 The Martin OMCPA4 also features a 000-14 fret cutaway body, particularly well-suited to fingerpicking styles, ensuring bends and licks can be performed with ease and projected beautifully. Furthermore, the OMCPA4 also has a venetian cutaway profile, providing easy access to upper frets and more challenging chords. Lastly, equipped with a Fishman F1 Analog system, the player can perform within live or studio settings and tweak their amplified sound to personal preference. 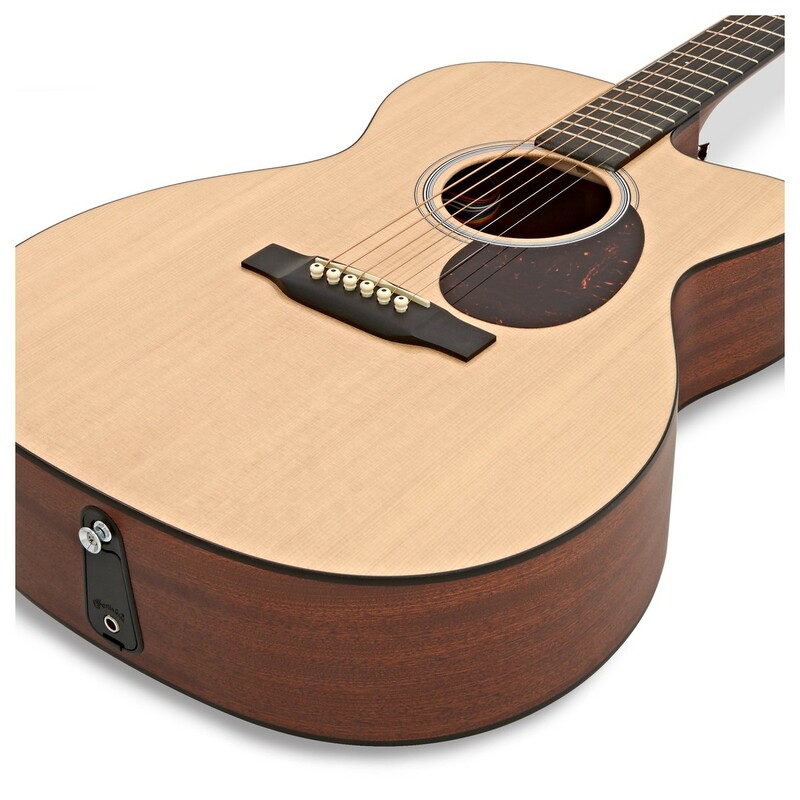 The Martin OMCPA4 Performing Artist comes equipped with a sitka spruce top that yields a crisp, articulate tone with a broad dynamic range, perfect for those craving an incredibly versatile playing experience. Sitka's nature also allows it to produce a clear, powerful sound with a little hint of brightness. Additionally, its strength and elasticity enable the OMCPA4 to handle numerous styles of play from meatier chords to lighter fingerpicking, as well as more alternative techniques. The sitka spruce top is accompanied by sapele back and sides that produce a well-balanced, defined and consistent tone. 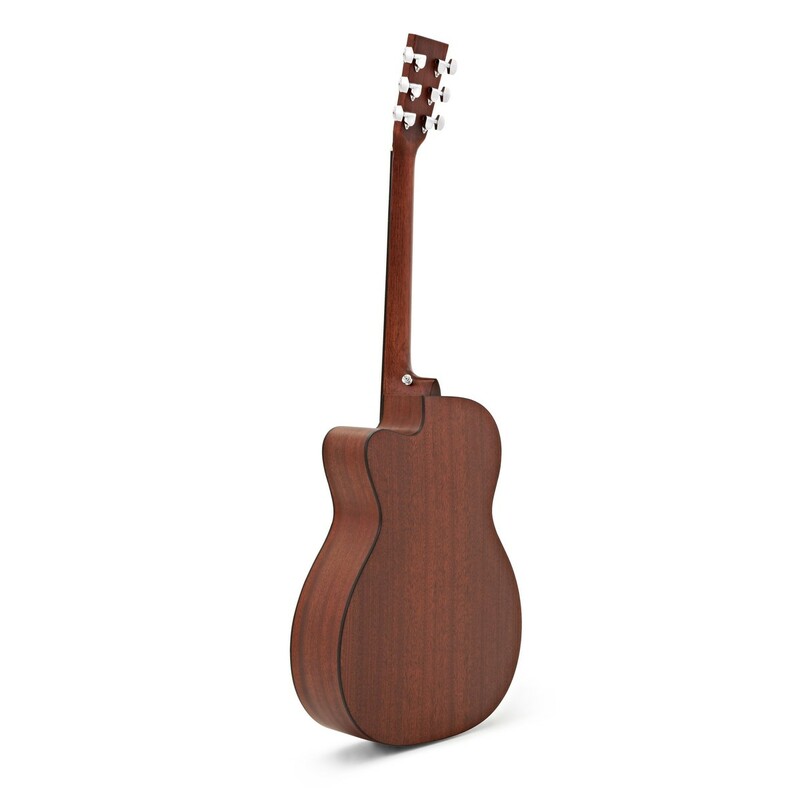 Furthermore, the sapele body also delivers a mellow warmth with a hint of treble zing. The select hardwood neck features a performing artist profile and high performance taper for enhanced playability. Additionally, its performing artist profile provides the player with a smooth, quick platform for unleashing true creativity while its wide high performance taper enhances playability and provides comfort. Furthermore, the neck is topped with a certified richlite fingerboard that simulates the sonically pleasing nature of ebony, adding sustain a plenty of bite to the overall sound. For added aesthetic appeal, the Martin OMCPA4 also has offset white plastic dot inlays, adding elegance to its performance-ready appearance. 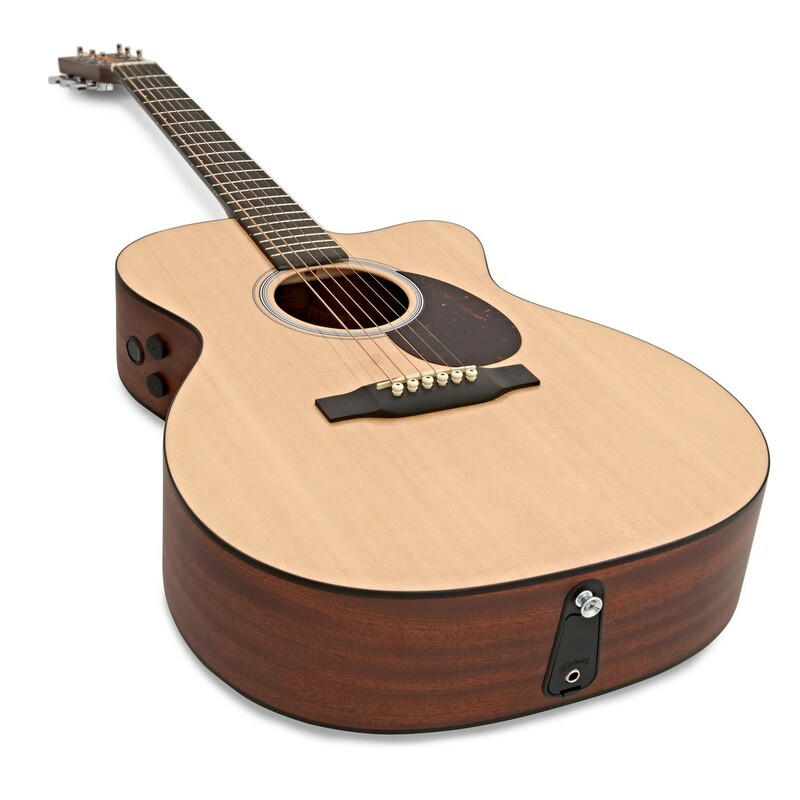 The OMCPA4 Electro Acoustic features a 000-14 fret cutaway body, similar in proportion to concert sized guitars. The OMCPA4's 000-14 fret body produces crystal clear clarity and superb tonal balance with superior sustain across the top-register. Additionally, its solid wood construction, 000-14 fret body and scalloped X-bracing allow the OMCPA4 to project a full, rich, and sonically-even tone, perfect for solo work or group jams. Furthermore, the OMCPA4 also provides a comfortable playing experience throughout both seated and standing performance due to its curvaceous shape, whilst its nipped in waist enables the player to hold the guitar close to the body for easier playability. For added comfort, the Martin OMCPA4 also features a venetian cutaway profile, providing easy access to upper frets and more challenging chords with ease. The Martin OMCPA4 comes equipped with a Fishman F1 Analog preamp system with an on-board tuner, perfect for live, studio, and rehearsal environments. The Fishman F1 Analog offers a convenient tuning system, the player can press and hold the volume button until the tuner turns on, and press the volume to turn off when not in use. 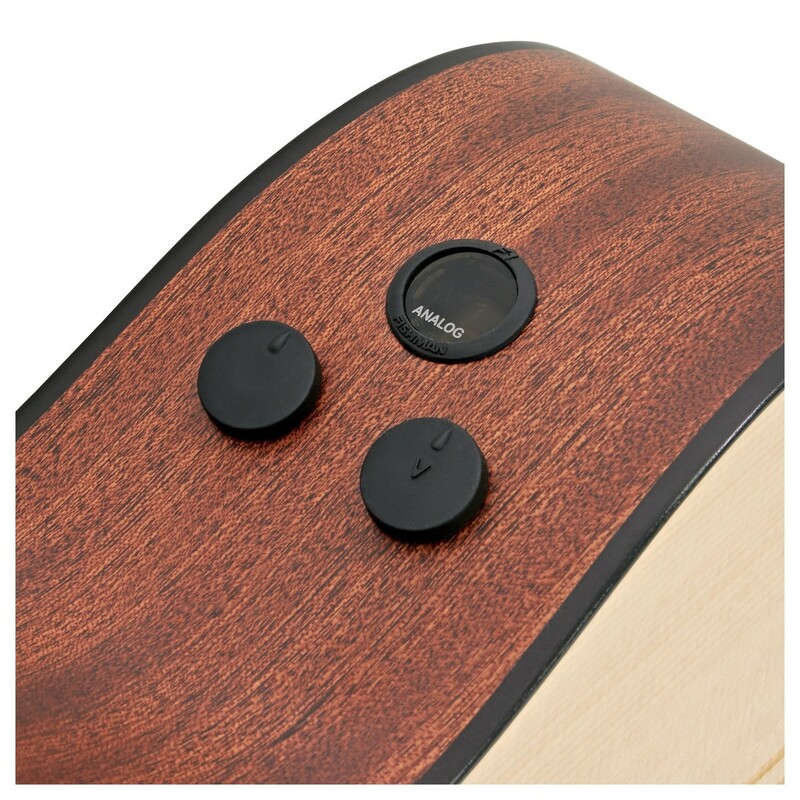 Additionally, the innovative tone knob also lets the player chose between a natural or undersaddle sound. Furthermore, the player is also able to adjust their amplified tone by turning the tone knob clockwise to blend in a mid-scooped tone with emphasised bass and treble with a reduced mid-range. Furthermore, the player can turn the tone knob counter-clockwise for more depth and clarity to the amplified sound, perfect for the player with a heavier strumming pattern. With this high-quality system from Fishman, the Martin OMCPA4 is perfect for the full-time session musician as well as the gigging guitarist, singer/songwriters and the recording musician. Scalloped bracing stops the guitar from collapsing under string tension and shapes the guitar's sound, allowing the top to vibrate more freely yet remains incredibly stable. Scalloped bracing also provides more emphasis to the bass response of the guitar and has been rewarded for enhancing the guitar top production. Plek Technology uses a computer-controlled machine that carefully measures each fret along with the fingerboard height under each string. This innovative Plek Technology then automatically dresses each fret, virtually eliminating string buzz and greatly improving the overall playability of the guitar. This pioneering process does the same work in a matter of minutes in comparison to how long it takes a luthier to complete the same job which can take up to several hours, sometimes even days to accomplish.